Click to hear In Dulci Jubilo (BWV729) by J.S. Bach as played by Eric Hepp. "Swell Organ (under expression; Manual III)"
"Choir Organ (under expression; Manual I)"
We are grateful to the firm of Rosenberry & Myers Organbuilders for the fine work they have done to restore and maintain our organ. Phase 1 and 1a were completed in 2008. Phase 2, awaiting completion, will restore both the Pedal 16′ reed stop and the Great Mixture IV. 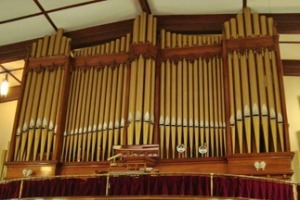 Phase also include the addition of a 2 2/3′ Nazard, a 2′ Flute, and an 1 3/5′ Tierce stops on the Choir division.